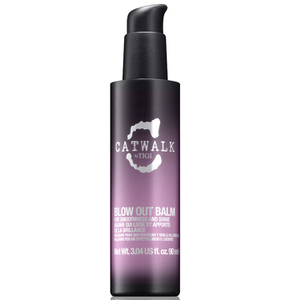 Salvage the wreckage with this protein-packed moisturising TIGI Bed Head Dumb Blonde Reconstructor. It can be used as a pH balancer, daily conditioner or as a hair mask on your highlighted, damaged or chemically treated hair. Dumb Blonde Conditioner contains wheat, soy, keratin and Pro-Vitamin B-5 complex to reconstruct your damaged hair. It’s not just for blondes though, this reconstructor is ideal for anyone with chemically treated hair. Water (Aqua/Eau), Cetearyl Alcohol, Cetyl Palmitate, Glycerin, Stearamidopropyl Dimethylamine, Fragrance (Parfum), Lactic Acid, Behentrimonium Chloride, Dimethicone, Phenoxyethanol, Hydroxypropyl Methylcellulose, Dipropylene Glycol, Polyurethane-39, Potassium Chloride, Disodium EDTA, Amodimethicone, Magnesium Nitrate, Cetrimonium Chloride, PEG-7 Propylheptyl Ether, Hydrolyzed Keratin, Benzoic Acid, Dehydroacetic Acid, Hydrolyzed Milk Protein, Silk Powder, Methylchloroisothiazolinone, Magnesium Chloride, Ethylhexylglycerin, Methylisothiazolinone, Potassium Sorbate, Yellow 5 (CI 19140), Yellow 6 (CI 15985). Unlike Vii, I did get my long bleached hair chopped off (a decision I deeply regret esp since using this conditioner). My hair feels so silky soft after using this. It feels and looks in much better condition and I only wish I had used this before having the big C!!! Use daily as a conditioner or leave in for longer as a treatment mask. Brilliant! MAKES MY HAIR SOFT, SHINY AND LOOKING GREAT. HIGHLY RECOMMEND!! 7/10/11 by new tigi dumb blonde fan! !